Due to rebuilding measures the hotel will feature more rooms than currently shown on the following site. We are going to update the hotel's presentation as soon as possible. 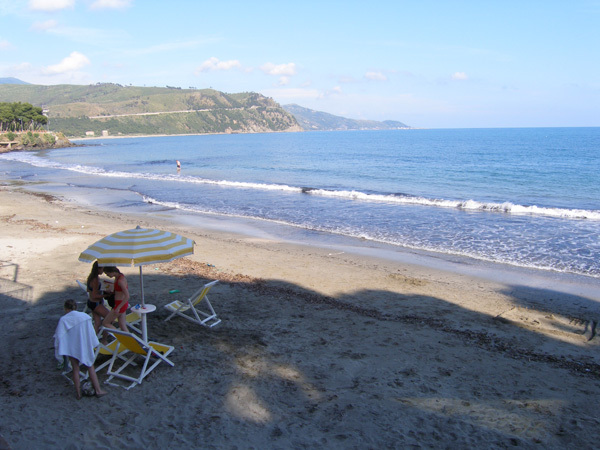 The family establishment right by the sea, which is located at the southern border of the Punta Licosa peninsula near Castellabate, has made a name for itself in the Cilento due to its excellent cuisine. The small hotel with a restaurant belongs to the four Verrone brothers and comes up last but not least with convenient and tasteful decorated rooms and a very friendly service. Hospitality there has been an affair of the heart for four centuries. 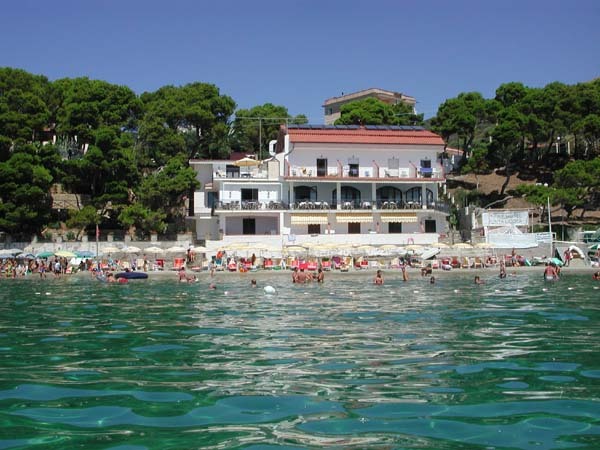 The Hotel da Carmine is located in Ogliastro Marina, a small village without any transit traffic. 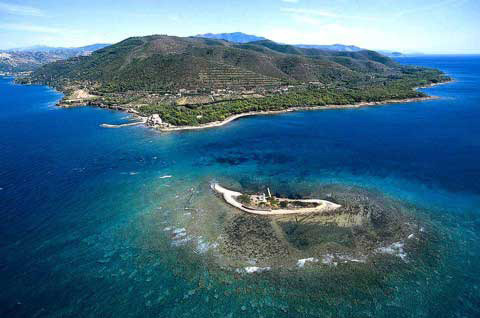 The street ends about 400 meters past the hotel and that is where the untouched fascinating landscape of Punta Licosa with its maritime wildlife park begins. The private sandy beach right next to the hotel is exclusively for hotel guests. The use of canvas chairs and sunshades is included in the costs. The fenced hotel parking lot is beside the Dependance. The main building accommodates 13 guest rooms, most of them with sea view. All rooms are equipped with satellite TV, free WiFi, safe, air conditioning, mini bar, hair dryer, bathroom with shower/WC/bidet and balcony. 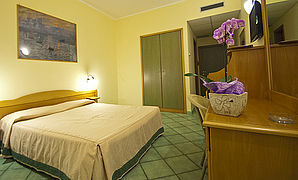 Another 6 guest rooms are located in the Dependance, which is 50 meters away. 4 of these rooms are very large and thus particularly suited for families: Up to 4 people can be accommodated. You can prepare little dishes in a small kitchenette. Sitting on your own terrace you enjoy a wonderful view over the mountainous landscape of the Cilento. 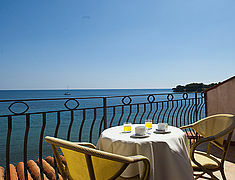 Just in front of the sea: the family hotel da Carmine in Ogliastro Marina (Castellabate). The 13 guest rooms in the main building mostly offer sea view. The hotel is located directly at the sea - Giuseppe Verrone (2nd from the right) with his kitchen team. 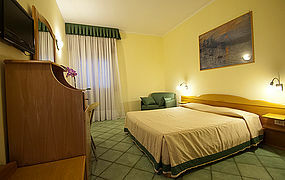 One of the 19 comfortable and tastefully furnished guest rooms. ...in the recently renovated dining hall. In the immediate vicinity of the hotel commences the untouched fascinating landscape of Punta Licosa with its maritime wildlife park begins. 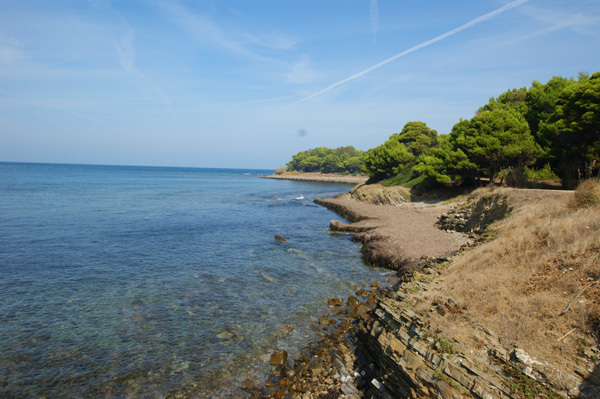 Tip for hiking tours: a footpath along Punta Licosa. Hotel da Carmine is located directly at the sea in Ogliastro Marina (Cilento). 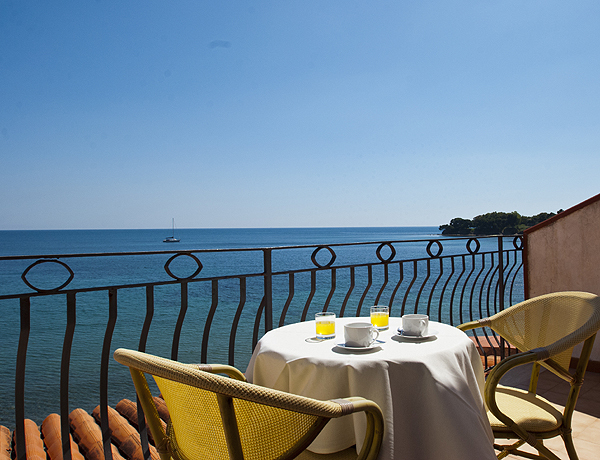 From most of the rooms in the main building you enjoy a gorgeous sea view. Tastefully furnished rooms in your Cilento-Hotel. The pines provide fpr comfortable shade on the beach. Pines provide for cooling shade on hot summer days. 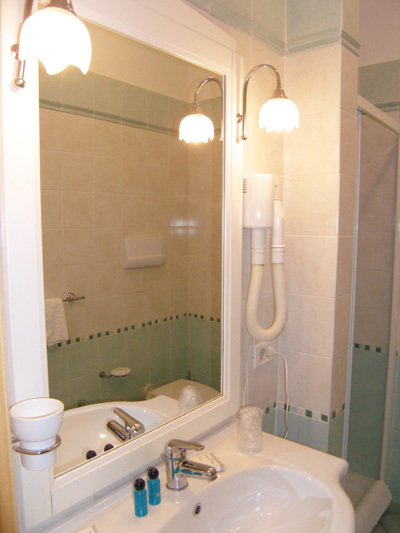 One of the well-tended bathrooms. Besonders gut gefallen hat und die schöne Gegend, die Freundlichkeit der Menschen und die Tatsache, dass es hier noch keinen Massentourismus gibt. Das Hotel hat uns unter anderem durch seine Sauberkeit und das freundliche Personal überzeugt! Wir empfehlen jedem, eine Bootstour ab San Marco di Castellabate zu machen. Wir kommen wieder in den Cilento! Die familiäre Atmosphäre und die außerordentliche Sauberkeit des Hotels haben mir besonders gut gefallen! Die Region zeigt einem noch das ursprüngliche Italien! Wir empfehlen jedem einen Besuch der Büffelfarm ‚Tennuta Vannullo’! Wir kommen bestimmt noch einmal hierher, denn wir haben bei weitem nicht alles gesehen – es gibt so schöne Wanderwege hier! Die Lage des Hotels ist einmalig und die Zimmer sind toll, vor allem auch hinsichtlich der Größe und der dazugehörigen Terrasse. Das Essen, vor allem die Fischgerichte, waren sehr lecker! Die Gegend und der Ort Ogliastro Marina sind wirklich schön. Wir werden wiederkommen! Landschaft, Leute, Essen, Trinken – alles top! Das Hotel hat eine super Lage, das Servicepersonal ist sehr gut und die Küche ausgezeichnet! Wir kommen wieder, denn die Gegend ist sehr schön und das Hotel hat uns prima gefallen! Wir haben hier einen wunderschönen Familienurlaub verbracht! Das Hotel, die Lage, das Essen und die Landschaft haben uns ausgezeichnet gefallen! Wir werden sicher einen weiteren Urlaub hier verbringen, denn es war sehr schön und sowohl die Gegend als auch das Hotel sind für einen Familienurlaub super geeignet! The prices for guest rooms are given in Euro and are valid per day for one person in a double bedroom (DR) with bed & breakfast, half board (HB) or full board (FB). Rooms without sea view and rooms in the Dependance: 10% discount. Extra charge for single rooms: 20%. Children from 2-12 years, in the same room with their parents: 40% discount. Children from 0-2 years, in the same room with their parents: free (including cot). Minimum stay in general 3 days. Max. 4 persons, 5 m to the sea, 1 bedroom, Pets upon request. Max. 4 persons, 50 m to the sea, 1 bedroom, Pets upon request.